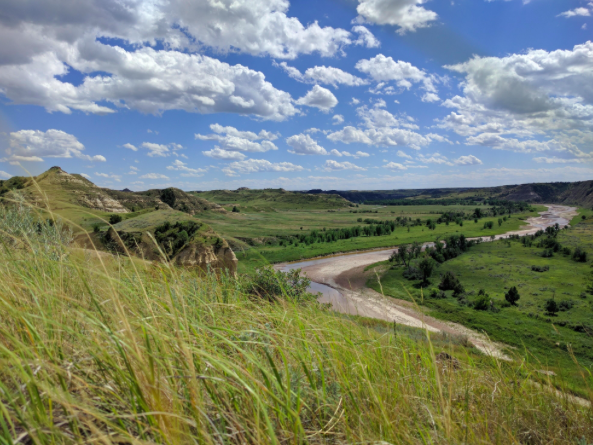 There are a million acres of public land in western North Dakota called the Dakota Prairie Grasslands, managed by the U.S. Forest Service. A management plan was written in 2001 to guide Forest Service employees, and in 2003, a “Record of Decision for Oil and Gas Leasing” identified lands open for lease and how oil and gas development should be managed on those lands. In 2012, a process was started to develop a Supplemental Environmental Impact Statement for Oil and Gas Leasing on our Little Missouri National Grasslands. The process moved ahead in fits and starts, hampered by a lack of funding and staff in the face of the demands of the massive development taking place. The document is 194 pages long. It was released in late October, and a notice was published in the Federal Register on Nov. 2, stating that the Forest Service will accept public comments on the plan for 45 days. That comment period ends Dec. 17, just two weeks hence. Everyone, from conservation groups to hunting groups to state officials, is upset with the short comment period. To leave so little time for analysis, after a 15-year gap in management ideas, leaves the impression the Forest Service is really not very interested in hearing what we all have to think about their proposals. So everyone — including Backcountry Hunters and Anglers, Badlands Conservation Alliance, the North Dakota Game and Fish Department and even the North Dakota Industrial Commission, which (sort of) regulates oil and gas activities in North Dakota — is interested in an extension of the comment period, to give everyone concerned about how the development of our grasslands goes forward a chance to study the plan and make comments and recommendations. Under Alternative 2, there would be no new oil and gas leasing, including on areas now under lease if the leases expire before the minerals are developed. The Forest Service says this alternative is being considered to address reducing greenhouse gas emissions and “eliminate potential effects for new leases to resources of concern.” (I’m not sure what that really means.) This is not a very realistic scenario, given the federal government’s need for the money the oil and gas leases and royalties bring in and the power and influence of the oil lobby. I think it’s the one I’d prefer though. Enough is enough. This alternative envisions continuing to lease federal minerals for oil and gas development but to add new stipulations to protect some threatened and endangered species, such as sage grouse, which are fast disappearing from North Dakota, and to enhance protection of roadless areas, rare plants and animals and recreation sites. They might also consider new restrictions on fracking to protect air quality under this alternative. The Forest Service says Alternative 3 is their preferred alternative, and it’s likely the one it will adopt as its new management structure unless it gets significant resistance during the public comment period. Except the devil is in the details. There are some really good people at work looking at all 194 pages of this proposed plan. But we need to make sure the Forest Service is really considering things like placement of roads, restrictions on flaring, reclamation of old and existing well pads when they are no longer in use, enhanced protection of roadless areas, pipeline permitting processes and seeking out new technology that will lessen the surface impact in the Grasslands. Studying all those things take time. And time is running out under the 45-day comment period scenario. And one more thing: It looks like the plan only addresses what is going to happen on new areas to be leased. There are lots of problems on areas already leased that need to be addressed. It would be nice if the plan addressed ways to minimize impacts to areas where the minerals are already leased but development has not gone forward. Otherwise, we just get more of the same. Protecting our public lands is important. Perhaps these wells and tanks could have been just a liiitle bit farther away from Lake Sakakawea. I asked the Forest Service this week if it has given some consideration to requests for more time for comments. In response, the Forest Service said it is going to hold a couple of meetings next week to share information on the SEIS. Meetings will be from 6 to 7:30 p.m. Dec. 12 in the Rough Rider Center in Watford City and from 6 to 7:30 p.m. Dec. 13 in the DSU Ag Building in Dickinson. The meetings will be in the open-house format the Forest Service is famous for, with no formal presentation, just a lot of experts on hand to answer questions in a one-on one format. I’m sure the Forest Service will have charts and graphs on display. Then, after the meetings, the Forest Service will decide between then and Dec. 17 if it will extend the comment period. Sounds like a busy four days to me. If you want to learn more about the SEIS, here’s a link to the eight-page Executive Summary. Comments can be mailed; hand delivered between the hours of 8 a.m. and 4:30 p.m. Monday through Friday; or faxed (yeah, right) to (701) 227-7801. Or you can e-mail comments to comments-northern-dakota-prairie@fs.fed.us, with Project 40652 in the subject line.